As fast food chain do, McDonald's recently posted a message for its burger-loving public on social media. Only this wasn't the typical menu of frying competitors, spicy puns, and cheesy jokes. The Golden Arches posted an optical illusion, which has garnered more than 15,000 likes on Facebook. The post consists of vertical lines, and they just asked if anyone can see the message hidden inside. There's no prize, just a little fun. Many commenters complained that the illusion was actually hurting their eyes and brain. "As if my eyes weren't bad enough [...] spent a good 10 mins looking at this now everything I look at looks like a zebra on steroids," wrote Bethany Wilkinson. Others wanted a little something for their trouble. 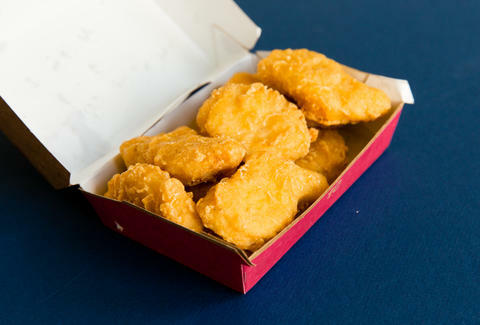 "Think there should be free mcnuggets for everyone that now has a headache trying to read it!!! That's me included," Trina Kay Blakely said. Others, like Ryan Dickson, just wanted a little help. "Help a brother out. I don’t know [what] it says, and I’ve been looking for 5 minutes," he wrote. McDonald's responded to some with an unsympathetic "#SorryNotSorry." Some commenters had questionable advice, which may have contributed to some confusion. One commenter wrote, "Shake ur head to read it." Though, maybe that worked for them. At least that sounded like advice. Jo-Die News advised other commenters, "It says 'send nudes' I'm not falling for that again." If these make your brain ache, you may want to avoid that list of the best optical illusions this year.